This summer has been pretty busy so far! Settling into the new apartment has been going well and we're finally starting to get a routine going although I do have some more travel planned in the next few months so nothing is too structured right now. I also have an old sorority friend staying at my apartment in a few days, so I'm excited to catch up and show her around our neighborhood. Then in a little less than two weeks it will be my sister's birthday (I get to go back to my hometown for a bit and celebrate!!) and after that I'm keeping myself busy with a number of projects! Seriously, I feel like I've been so busy lately it's insane. Not complaining though, I love staying busy, especially if it means working with brands I love on the blog! I feel like I haven't listened to music in so long! I used to listen to most of my music when I drove around town, but since leaving my car at home it's like music barely exists! I did recently go to Harry Styles' concert, so his album has constantly been playing in my mind (if you haven't listened, it's great!). I'm also a fan of John Mayer's latest hit 'New Light,' it's a little more reminiscent of his older stuff which I'm more of a fan of! Desperate Housewives, Psych, and Chuck. All shows I've watched before and love. I used to watch DH back in the day with my parents and never got around to actually finishing the series, so after noticing it on Hulu the other day I decided to restart the show. It's so dramatic and has the craziest story lines, I love it! Chuck and Psych are both on Amazon Prime and are hilarious crime shows. They're also two of my favorite shows so I highly recommend them! My next vacation. My sister and I are planning something really fun that I've wanted to do for YEARS, although it's so far away right now that it doesn't seem like a reality. More on this at a later date, but let's just say I'll finally be going to my dream vacation spot! Unfortunately not much. I was recently hit with the stomach flu and didn't eat for a full two days, so not what I wanted to be doing this past week. Thankfully I'm already getting my appetite back and am feeling MUCH better! Tons of water, gatorade, and ginger ale! I'm hydrating like crazy and am loving what it's doing to my skin, although maybe that's me getting healthy again, haha! The Chronicles of Narnia, haha! It's a movie series that I love and have always wanted to get into the books, so I figured why wait any longer?! It's definitely for kids, but I'm still loving them for the nostalgia. I haven't gotten to any of the books that don't have a movie, so it's been fun to compare the two. My next two trips. Like I said I'll be traveling home for a few days to see my sister and we have so many things to schedule into my short time there. I would love to say it's all fun stuff, but there's a lot of business in there as well. As for my next trip that will be for another birthday, my friend Nicole! We were roommates in college for 3 years and I'll be traveling back to Southern California to go to her murder mystery themed party! Fall! It's one of my favorite seasons, and I can't wait to see the city in the cooler weather. I was here for a brief amount of time last fall and enjoyed the weather, so I can't wait to see the city change. I also can't wait to start pulling out my sweaters and coats! These leopard slides! I'm a lover of slides, mostly due to my laziness, haha. They're so easy to put on and match with any outfit, plus there are just so many different styles available now! I saw these slides on Instagram a while back and fell in love, and was so glad that they were from Target. That means I know they're going to be a good deal. 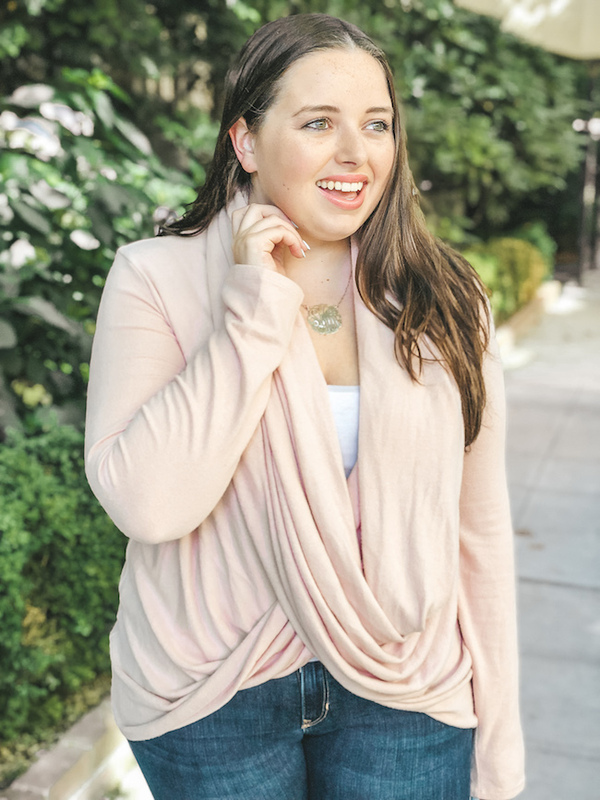 I've also been obsessed with this convertible wrap cardigan! I purchased this as a last minute whim at the Nordstrom sale (still going on until the 6th, so shop my picks while you can!) and think it's the absolute coziest thing I've ever tried on. It's incredibly soft and I can't wait to wear it as the weather cools down! It's on sale right now for $46, and when the NSale finishes up it will go back up to $68, so if you're interested I would get it before the price increase! So what did you think, do you enjoy these types of posts? Let me know in the comments along with what's been going on in your life lately! Fall is my favorite! While I love pool days I can't wait for the cool mornings! Desperate Housewives is an all time favorite of mine! I cannot wait for Fall either!! That cross top is also soo cute!! Love this whole post! Those are cute slides! I am a fan of them as well. I've been rewatching Gossip Girl, which is similarly dramatic as DH. I love these types of posts! They're always so fun for me to read! I'm LOVING your leopard slides! I actually love this idea! I can't believe summer has gone by so fast! I have been watching "The Handmaid's Tale" and omg it is soooo crazy! Ahhh! I've always thought it would be fun to watch Desperate Housewives but I think it's only on Hulu- not Prime or Netflix! :( Sounds like you've really been settling into your new city! I have never watche Desperate Housewives in my life. I have heard moxed things about it.. but maybe I can give it a try. That top is so fun- I love the color! Can't wait to hear more about your upcoming trip! Counting down the days until it's officially fall. I have been obsessed with listening to Kane Brown. 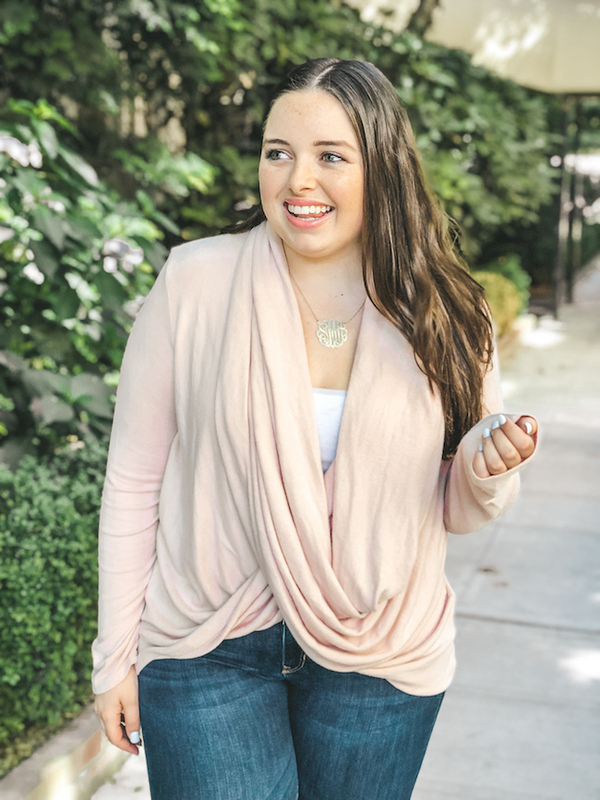 Love the cardi and l can’t wait to hear about your dream vacation spot! I'm so ready for fall too - the summer heat is killing me! I've been thinking about starting Desperate Housewives (can't believe I've never watched!) but I know it's a serious time commitment to binge, haha. I love summer, so I'll definitely miss it when fall comes around, but I'm so excited to be rocking those vampy lips for the cooler seasons! I love your top! The color suits you well. I hope to visit US soon. Looking forward to your upcoming travels. I love this new post series! I did something similar and it's so fun to write too! Sorry that you had the stomach flue, but glad you're on the mend now! I can't believe fall is around the corner. So excited for football games and cooler weather. I'm planning a lot of trips, too! Always fun to have something to look forward to and go to different destinations. I love your sweater! I tend not to listen to as much music when I don't drive my car either. You will definitely have to keep reading The Chronicles of Narnia...the whole series is amazing!